The memorial day ceremony at Citizens Cemetery begins with various community organizations entering as a procession. 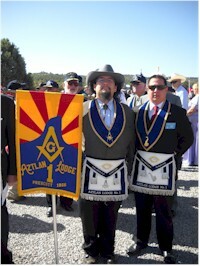 Aztlan Lodge is the first and oldest Prescott organization and as such it always leads the procession. 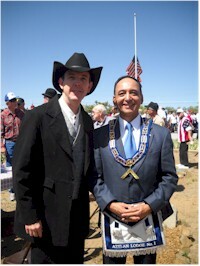 In 2012 Worshipful Master George Weil with Senior Warden Granville and Junior Warden Demuth led Aztlan Lodge brethren to the ceremony followed by Order of the Eastern Star, Golden Rule Chapter No. 1. In 1864 Citizens Cemetery was established the same year that Prescott was founded as the Arizona Territorial capital. It contains the graves of veterans of numerous wars, including the Civil War. 2012 Senior Deacon Eric Giler-Tomala and Senior Steward Daivd Sahady proudly served as Aztlan Lodge standard bearers for the procession. The Memorial Day ceremony is one of the few opportunites to wear your apron in public.